Photo credit: Kate Ter Haar, CC BY 2.0. I collect those souvenir pennies that you get by placing fifty-one cents into a machine at a tourist attraction and turning a big crank. A while ago, I got into the habit of holding onto exceptionally shiny pennies in my wallet whenever I found them. Last week, I went to the grocery store for lunch and my total came to $12.05. The cashier asked me if I had a nickel and when I opened the zippered compartment on my wallet to check, she spotted my pennies. There were only four and before I could say so, she said she’d take them, even if there were less than five, because she didn’t want to have to give me ninety-five cents. I didn’t know how to say, as a 27 year-old woman, “Oh, no, you can’t have these, they’re future squashed pennies,” so I gave them to her. Whenever I pay for something with cash and get coins back, I put them into the zippered compartment on my wallet. When I get home, I put them into a glass bottle I keep on my dresser. I bring the bottle to the bank when it’s full. This is what I’ve done for years. My bank used to have those coin sorting machines called Penny Arcades. They had interactive touch screens with a cartoon character named Penny who would guide you through the process of how the machine worked. She told you where to put the coins and to be sure there were no paperclips or anything else mixed in with your change. She would always ask if you wanted to guess the amount you’d saved before the machine counted them. You could win some sort of prize—usually an ugly plastic piggybank with the bank’s logo on it—if you guessed within a certain threshold. I never participated in this step, but when my ex-boyfriend came to the bank with me, he would always make a guess. He did his banking elsewhere, so the machine and free lollipops on the counter were still novelties to him. Six months after we broke up, there was a scandal about the Penny Arcade machines: apparently they were ripping us all off. We’d been shorted, during each transaction, of anywhere from a few cents to a few dollars. Right now, I have one full bottle of coins and a second, almost-full one on my dresser and I’ve been holding onto them because I don’t know where, in 2017, you’re supposed to even get coin-rolling papers and all of that. I’m assuming the tellers will judge me for bringing in all of these wrapped coins or the other customers will resent me for holding up the line. I know this isn’t actually a hard task; it’s just slightly less convenient now, and so I’ve let the change pile up instead of taking care of it. I still have coins from purchases I made while my ex and I were still together. I wonder how many of those quarters were change from the meals I’d buy us toward the end, thinking that if only we sat across from each other at enough of our favorite restaurants and acted like everything was normal, things would somehow be normal. When I knew our days were numbered, I’d spent a lot of money trying to achieve the type of relationship that I was afraid I’d never get back. I paid nearly $40 for us to see a children’s movie in 3D that I hadn’t even wanted to see. I knew he had an inside joke about this movie with someone else (his next girlfriend, it turned out) and I thought if I was the one who saw it with him, who sat beside him and who paid for the tickets, I could get in on the joke. I paid for us to go to the county fair, something we’d enjoyed the previous few years, thinking nostalgia and sugary lemonade could save us. I paid for so many restaurant meals that I barely touched because I was too anxious to eat and food tasted like nothing. I used to be a pretty change-averse person. I thought I “knew who I was,” as if my identity were set in stone. It made me uncomfortable to stray from anything that I didn’t think fit into how I saw myself. I thought my ex was also like this. One of his favorite songs repeats the line to stay the same to never change and I think back then part of me thought that’s what you signed on for when you entered into a relationship: some level of personal stagnation. Growth was only okay if both people were on the same page about it. I thought I needed permission to become someone new and I resented when he didn’t extend that courtesy to me. I remember when he first started drinking whiskey. You don’t like whiskey! I’d wanted to scream. And then there was this line from another song he liked: we have to change if we’re gonna stay together. I’ve changed a lot in the two years since that relationship ended. I quit my lifelong habit of biting my nails and I grew out my bangs and I learned how to speak up for myself. I learned how to ask questions. I am more capable of telling people what I need from them (and what I do not). I think I am a better consumer and producer of art. I think I understand feelings more than I ever have. I am less skittish and I feel more okay with taking up space in the world. I bought a shirt that has the shoulders cut out of it—the kind of trendy thing I never would have allowed myself in the past. I’ve learned how to sit with myself and have that be enough. 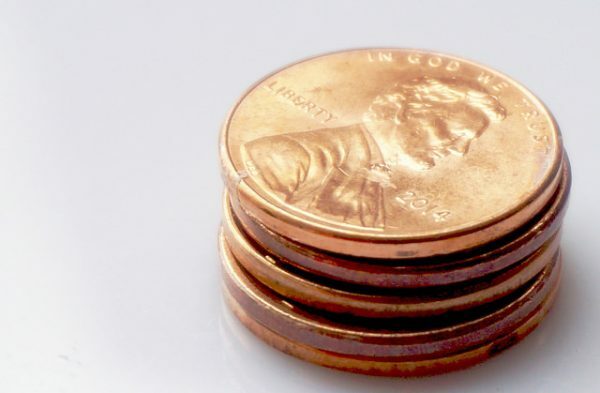 Last week, after I told him about what happened at the grocery store, my boyfriend said, “I have something for you” and when I held out my hand, he placed eight shiny pennies into my palm, two for each one that I’d lost. Kerri Sullivan is a writer and librarian from New Jersey. She publishes one “this is about” essay every month on her TinyLetter and is very active on Instagram (@ksulphoto).